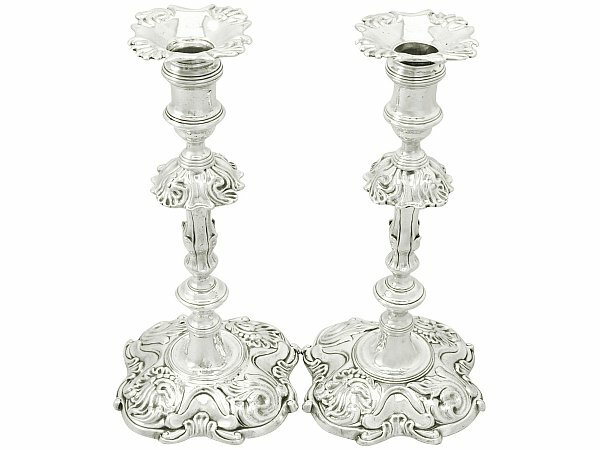 These exceptional antique George II English cast sterling silver candlesticks have a plain shaped capital with a knopped stem onto a sunken well to a shaped incurved base. The waisted cylindrical capitals are encircled with bands of thread decoration to the upper and lower portions. These exceptional Georgian candlesticks retain the original detachable push fit sconces with shaped scrolling decoration to the shaped rims. Each sconce is embellished with a bright cut engraved crest of on a chapeau a griffin passant the wings elevated holding in the dexter claw a sprig of laurel. The knopped stem of each candlestick is embellished with scrolling shell designs, accented with further bands of thread decoration. The shaped bases of these antique candlesticks are ornamented with large and unusual shell formations in a swirl design, accented with scroll decoration to the shaped rim. The bases are not weighted. 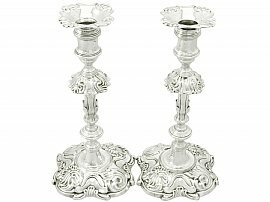 These antique sterling silver candlesticks are an exceptional gauge of silver, exeptional quality and in excellent condition. Full hallmarks struck individually to each corner of the underside of the rim of each candlestick are very clear; one maker's mark is poorly struck. The lion passant mark to the capitals are worn, in keeping with age.